Is JAKKS Pacific Staging a Comeback? JAKKS Pacific's stock has been climbing back from a low point over the past few months. Is this a toy company built to survive the technological revolution? 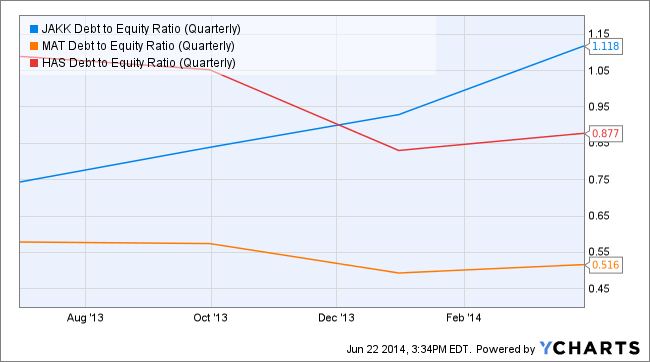 JAKKS Pacific (NASDAQ:JAKK) has been through quite a lot over the past few years. The toy maker's stock hit multi-year lows in October but has since rebounded due to an improved financial performance and landmark developments, such as a new partnership with Skechers (NYSE:SKX). All of this begs the question: Is JAKKS Pacific a toy company built to survive the technological revolution, or should investors shy away? When I last covered JAKKS Pacific in October, the company was in turmoil. Fast forward eight months, and we can see that times have indeed changed for the better at JAKKS Pacific. In its most recent quarterly report, the company showed investors it may be soon turning the corner after years of declining sales and disheartening losses. Net losses were narrower than analyst estimates, and JAKKS actually posted a 5.7% year-over-year revenue increase. Earnings were helped by JAKKS' strong toy lines and newer products. While the latest quarter may be a sign that better times are ahead, JAKKS still has a long way to go to become profitable. On top of that, the company's large debt load has increased as JAKKS' leadership has attempted to use debt as leverage to snap the company out of its funk. In comparison, industry rivals Mattel and Hasbro have seen their debt loads stay at fairly healthy, steady rates. JAKK's debt accumulation may weigh on the bottom line moving forward but it might just give the company the time it needs to grow its product offering and return to delivering profitability. Investors do need to keep an eye on JAKKS' debt as the company seeks to grow its way out of the whole that it finds itself in. In May...the company inked a long-term licensing agreement with California-based leading lifestyle footwear manufacturer Skechers to manufacture a series of toys and products inspired by the Skechers brand...The company's newly launched mobile gaming apps and Blu-ray DVDs as well as the Hero Portal gaming console (to be launched in [September] will help in brand building apart from capitalizing on the increasingly lucrative technology-based gaming market. Not only does JAKKS have a new partnership with Skechers, but it also has ongoing deals with Nickelodeon, Disney, Saban Brands, and Cabbage Patch Kids that add further richness to its portfolio of products. Saban Brands in particular is seeking to capitalize on technology with JAKKS by its work on Emojiville, a web/television series and toy line about popular text messaging emoticons. While JAKKS does have an improving financial position and seems to be adapting well to changing market trends and technology, purchasing JAKKS' stock is essentially a dice roll at this point in time due to the company's debt load and financial losses. The long-term prospects for JAKKS seem much better than they did in October. For investors looking for growth-stock opportunities in the toy industry, JAKKS may be the right selection for your portfolio.